What’s your favorite food made from fresh strawberries? Of course you can eat them as a topping on ice cream, or waffles or pancakes, or in a bowl with sweetened whipped cream on top. On cold cereal. On a saucer with sugar sprinkled over them. But – there’s also homemade strawberry jam, strawberry bread, and cookies, muffins and the king of desserts, strawberry shortcake. We had fresh strawberry muffins for breakfast this morning … wonder if there are any left? H’mmm. I am a little hungry. Mmmmm … does anything smell more like summertime (and make your mouth water) than a flat of freshly-picked strawberries on the kitchen counter as you walk in the back door? Here’s a tip to get those cores and tops removed easily. Get a plastic drinking straw and hold it firmly between your thumb and first finger. Push it up through the strawberry, beginning at the tip or pointed end. It’ll take the core of the strawberry out for you – and remove the top, too! What’s left in the straw looks like a miniature palm tree – just squeeze the straw to get it out, and go on to the next plump, ripe strawberry. Sunshine today, and the wranglers are checking the progress of the strawberries. We can’t wait for that delicious, sweet berry to be ready by the handful or the quart! 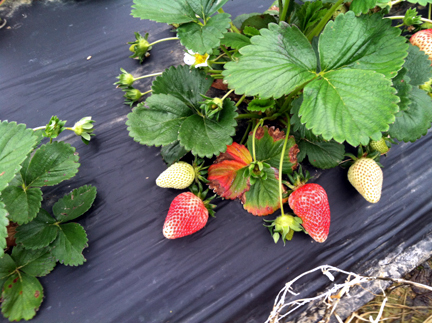 Did you know strawberries need sunshine to make them sweet and flavorful? During times of little to no rain, we all mutter about “doing a rain dance.” Right now, perhaps we should be out at the You Pick patch doing a Sunshine Dance. Bring your sombrero and join me!